It was cold in Taipei yesterday- all of 17 degrees c. Which is starting to feel frigid now at I've been here a week. After a night of random debauchery with some Germans, Brits and Taiwanese we met at a Bavarian beer and schnitzel house, we were in need of something comforting to breathe life into our cold, booze-addled bodies. There's a pasta joint right outside our apartment that always smells incredible so we lumbered in and filled our bellies with steaming bowls of garlic blasted spaghetti noodles. Amazing. 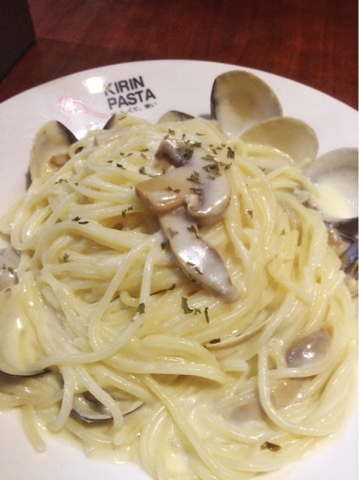 Alfredo with sweet, briny little clams and mushrooms. Garlic heaven. 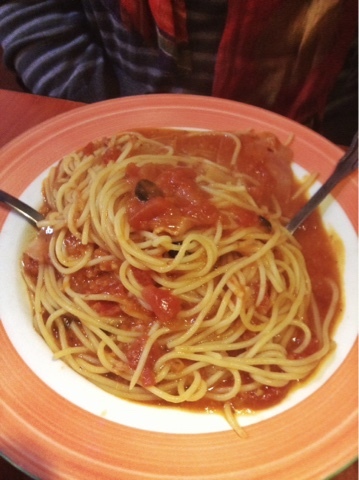 Sweet tomato sauce with bacon. 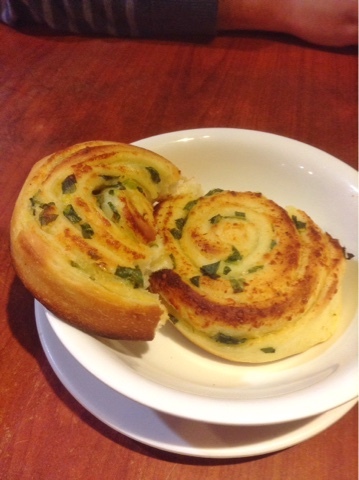 Spicy scallion rolls. Sometimes nothing says "mommy" like good old American-Italian-Taiwanese fare. The Olive Garden's got nothing on these guys.